Does your Mom love Boston? 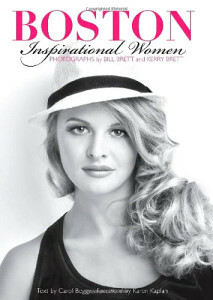 The photography team of Bill and Kerry Brett released a beautiful black and white photography book titled Boston, Inspirational Women . It includes 125 photos of not just celebrities like Maria Menounos and politicians but also women who stand out for what they are doing in the community. This was highlighted in a list recently for a great Mother’s Day gift in the G section of the Globe. I could not agree more, especially if you are a fan of everything Boston. Bill Brett is a well-known retired photographer for the Boston Globe. My husband is also a fan and has his other “coffee table” photography books Boston, All One Family and Boston: An Extended Family. Kerry Brett is his daughter and also a professional photographer. She adds a younger viewpoint to the women she chose to include. What are some other Boston inspired gifts your Mother may enjoy? Feel free to add your ideas in the comment area.